Victor Zhang was recently named Director of SBD Automotive’s new China office. We managed to sit down with him (wake up incredibly early and Skype with him, as he’s in a country 8 hours ahead of our UK headquarters) to find out what his role entails, how difficult it is to open an office in China, and why Shanghai was chosen as the latest location for SBD. Job Title: Director, SBD Automotive (Shanghai) Consulting Ltd.
Hi Victor, thanks for joining us. Could you tell us about your role at SBD Automotive? Certainly. I am the Director of SBD Automotive (Shanghai) Consulting Ltd, which is a sales and research office for SBD Automotive in China. SBD has been providing services to OEMs in China for around 10 years now, visiting when necessary. We believe that China is a vital market, so I now lead a dedicated team of analysts and consultants, based here in Shanghai, focused on connected, autonomous and secure technologies. The founding team in China is formed of local staff, but all have experience working around the world in the automotive industry. How long have you been with SBD? I joined over 6 years ago, in 2011, as an analyst for what would now be called SBD Connected Car, although at the time it was called the Advanced Research Division. SBD had been researching connectivity in China since the mid-2000s, and I was brought in as part of the plan for the eventual expansion. You then moved to China to set up the office? Yes, I was heavily involved in the setup of the office. At first, it involved a lot of hotel rooms and living out of a suitcase. We started to get orders right away, so I needed to make sure we had enough people. It’s very busy; the pace is much faster than in the UK. You never get to rest, you can be called at any time. Was it difficult to open an office in China? There are additional hoops to jump through when a foreign company is establishing a new company in China (a WFOE). It’s definitely not easy, and it takes time, but it’s certainly worth it to give our clients all the benefits of an SBD office here. We can now offer our global services locally, giving clients more relevant market research and timely local support. So, why was Shanghai chosen? A lot of our clients are based in Shanghai. It is an incredibly dynamic place; a centre of innovation that really suits SBD. Shanghai is really the heart of the automotive industry in China. It has become the hub for OEMs and start-ups focused on autonomous driving technologies. 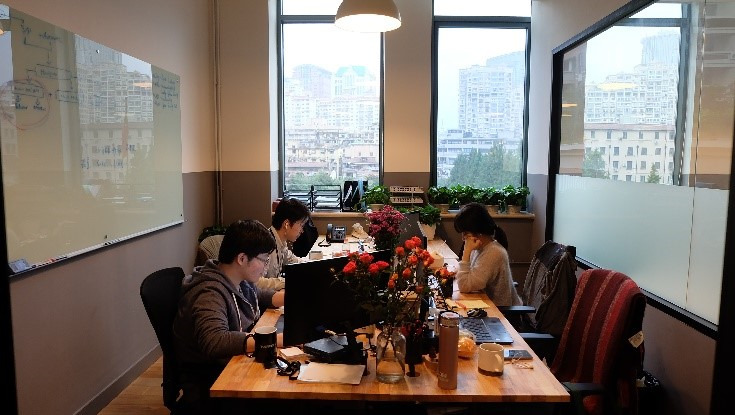 SBD has the industry's largest connected and autonomous car consulting team and we are recruiting right now, so I expect our team in Shanghai to expand again very soon. I imagine it makes it easier to attend events in China now that we have a base there? Definitely. I spoke at four or five events in the first few months. We have a long history of presenting at automotive technology events here. We were at the very first Telematics @ China, back in 2008, and next month (6th – 8th December) I will be attending Telematics @ China’s tenth year, as SBD is the Knowledge Partner. It’s great to be part of the growing automotive industry and culture here. I will be speaking on User Experience (UX), focusing on best practices gained from our years of research and testing around the world. We will have a booth too, so it will be a fantastic opportunity for people to meet the SBD China team, and to see how we can help them navigate the changes in both the Chinese and global automotive industry. How is the automotive industry in China currently changing? SBD has been researching China for 10 years from afar. We knew then, and we know now that it is vital to pay attention to this market. The market is changing rapidly. Almost all OEMs in China are offering some sort of connected car solutions. Connected features are now becoming the way brands differentiate themselves from the competition. The government is putting forward motivational incentives to encourage the development of autonomous cars, with the focus on Artificial Intelligence (AI) being raised to a national level. It’s certainly becoming more competitive, more dynamic, more innovative. Panos Konstantopoulos, one of SBD's UX experts, mentioned in a recent interview that different cultures value different styles of UX. I assume local offices are a big benefit when looking at cultural preferences? Being in China, we can keep pace with the fast changes in the China market, the new technologies, and the changes to consumer demands and preferences. It allows us to see the inside effects. We don’t just see what happens, we can see how and why. It helps us provide our clients with the most accurate and up-to-date information, improving the quality of SBD’s services globally. We can talk to more OEMs and consumers, we get to have a unique viewpoint of how the market is changing. It allows us to see, from the top of the mountain, how everyone is reacting, letting us see through the hype, helping us bring clarity to our clients. This is a big part of where our value resides. It is easy to be blinded if you only see from one perspective. China is the largest automotive market in the world, and you just have to look at the Frankfurt Motor Show this year to see that the global market share of Chinese automobiles is only going to increase. With the new offices in Germany and China joining our existing footholds in the UK, Japan, North America and India, SBD is now positioned in every major automotive market. Ask me again in a couple of years, it will be interesting to see how far we’ve pushed ahead as an industry. You may also be interested in SBD Automotive's Connected Car User Experience Evaluation, and the ADAS HMI Benchmarking report series.